HNA Group of Hainan, China was founded in 2000. Flexing the new found strength of the Chinese Economy, the Company embarked on a multi-year buying spree using highly leveraged Corporate Bond programs to acquire Premium Worldwide companies. 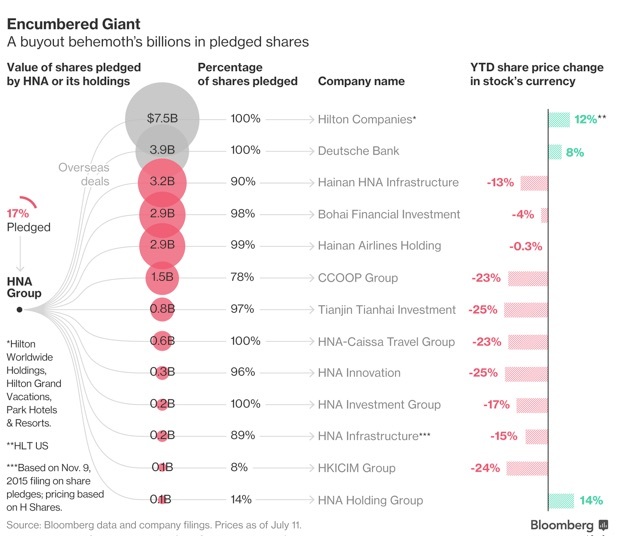 HNA has taken huge positions in Hilton Worldwide with reports that it’s ownership has risen to 25%, a 10% stake in Deutche Bank, the largest Bank in Germany and a Global Institution, and Prime Commercial Real Estate in Manhattan, San Francisco, Chicago, and Minneapolis with billions of Financed Dollars! Reports are now surfacing that HNA is unable to service the debt and Liquidation of assets is starting. 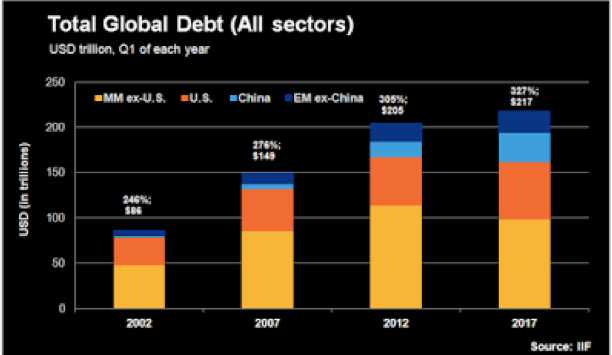 Global Debt has risen far beyond the then record debt of the Great Financial Crisis. Conglomerates, States, Municipalities, and Sovereign Nations have GORGED on cheap rates and tricky financing. These Borrowers are no different than any Household; eventually Debt OVERWHELMS and a period of adjustment ensues. The adjustment usually consists of defaults on loans and bonds causing financial stress to not only the Borrower, but also the Lender that has obligations that must be met from the intended loan servicing. Insurance Companies with Annuity Policies, Health Policies, and Life Insurance Policies as well as Pension Funds with monthly obligations to Retirees will be placed at Risk. Banks and financial institutions may be at risk. Often these Institutions develop a lending relationship and assume too much risk by being the Prime Lender; huge transaction profits initially, then disaster eventually! 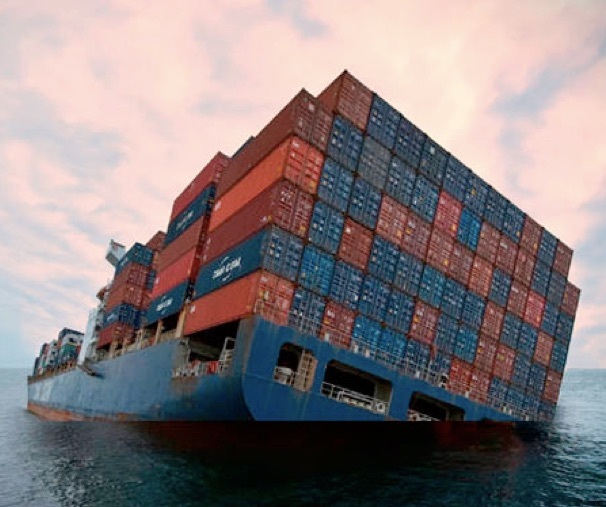 Should a Global Slowdown appear and there are indications that one has started, other Highly Leveraged formerly Global Conglomerate Darlings will Fall. The Globe is very intertwined; when Hanjin Shipping of South Korea went Bankrupt, Landesbank in Germany was affected with huge Hanjin debt. Steinhoff of South Africa is in trouble and US Banks are a risk of losing $1 Billion Dollars in loans. Other Chinese firms that have been buying, and buying, and buying are also in trouble. Dalian Wanda, Sunac, Le Eco with massive debt have been mentioned as struggling. Everything is fine until it is not! Leverage allows for enormous profits when all is good, but make a miscalculation, a marketing mistake, or associate with the wrong counter party and Debt will be RELENTLESS. Already, Economic Powerhouse South Korea has reported that the 4th Quarter of 2017 printed not a growth slowdown, but an actual Contraction! Currently, the Mantra has been “Coordinated Global Growth”! If one looks “Under the Hood”, there are cracks beginning to form. Your FUTURE is at Stake! Check you finances, your debts, your assets, your Insurance and Annuity Policies, and your Pension Provider. There is still time to develop “Plan B”. However, Time may be Running Out! This entry was posted on February 13, 2018 at 7:06 PM and is filed under Michael Douville with tags china, Debt, global debt, HNA Group, pensions, Romans 13. You can follow any responses to this entry through the RSS 2.0 feed. You can leave a response, or trackback from your own site.